What Makes the Solar System Like a Crime Scene? Niku is the Chinese word for rebellious — and it’s the name scientists have given to a new space object that orbits wildly out of sync with the rest of our solar system. Located in the Kuiper Belt, beyond the orbit of Neptune, Niku is a piece of icy debris roughly 100 miles across. Recently, scientists discovered that Niku’s orbital plane is tilted by 110 degrees to the sun. Not only that, but Niku also moves around the sun backward. The astronomical community is taking note of the discovery because there’s just one other known object in our solar system with a similar orbit. Drac was discovered in 2008, also in the Kuiper Belt and travels backward at an inclination of about 100 degrees. Together, the odd orbits of Niku and Drac raise questions about what may have sent them spinning out of step millennia ago. Konstantin Batygin, a professor of planetary science at the California Institute of Technology, says that except for its wild orbital path, nothing about Niku raises eyebrows in the neighborhood. The Kuiper Belt is a field of similarly icy debris objects, among them Pluto — which you’ll remember was downgraded by astronomers from “planet” to “dwarf planet” about a decade ago. One theory about why Niku and Drac have such peculiar orbital paths involves Planet Nine, a distant, hypothetical ninth planet in our solar system. Batygin says that in their current positions, Niku and Drac are too close to Neptune for their orbits to be affected by Planet Nine’s gravitational influence. But what if Niku and Drac used to be closer to Planet Nine? According to Batygin, the hypothesis that Planet Nine somehow sent Drac and Niku into their strange orbits is at least worth further investigation. If one strangely orbiting space object is an anomaly, two strangely orbiting space objects are just the tip of the iceberg. Batygin and other scientists hope that the discovery of Niku will focus efforts on piecing together a new picture of the early solar system — perhaps one that sheds more light on Planet Nine. Konstantin Batygin is an Assistant Professor of Planetary Science at the California Institute of Technology in Pasadena, California. IRA FLATOW: Niku is the Chinese word for rebellious and that’s the name scientists have given to a new space object that marches to the beat of its own drum– more specifically its own orbit. Earlier this month, scientists discovered Niku’s orbital plane is tilted by 110 degrees to the sun. That’s past straight up. And it’s traveling a path that’s practically perpendicular to every other object in the solar system. What’s even weirder is that it also moves around the sun backwards. There’s only one other known object with a similar orbit in the entire solar system, and that’s called Drac which was discovered in 2008. And scientists are still looking for a way to explain that peculiar object. Well joining me now to talk about– this is a man who is no stranger to unsolved mysteries of the universe. His research is focused on the hunt for the elusive Planet Nine. Konstantin Batygin is assistant professor of planetary science at Caltech. Konstantin, welcome to Science Friday. KONSTANTIN BATYGIN: Thanks for having me. IRA FLATOW: You’re welcome. So what is Niku? KONSTANTIN BATYGIN: Niku is a piece of icy debris that resides beyond the orbit of Neptune. It’s probably about 150 kilometers across, or the size of LA and Orange County combined. And from the point of view of its physical properties, right, it’s a relatively typical Kuiper belt object. But its orbit is truly what’s exciting about this new body. Like you said, it orbits on its side– pretty weird. IRA FLATOW: On its side, over– its 110 degrees orbiting on its side. So its axes are tilted, so to speak? KONSTANTIN BATYGIN: That’s right, yes. So if you were to draw the solar system, I mean any third grader will draw the solar system kind of on a piece of paper as a bunch of concentric circles. This object comes out of the piece of paper kind of almost in the perpendicular sense, except for it’s a little bit worse than that. It’s tilted in the wrong way. It’s not just taking some of these circles and putting them out of the plane, it’s putting them out of the plane by more than 90 degrees. IRA FLATOW: And so it comes from the Kuiper belt. 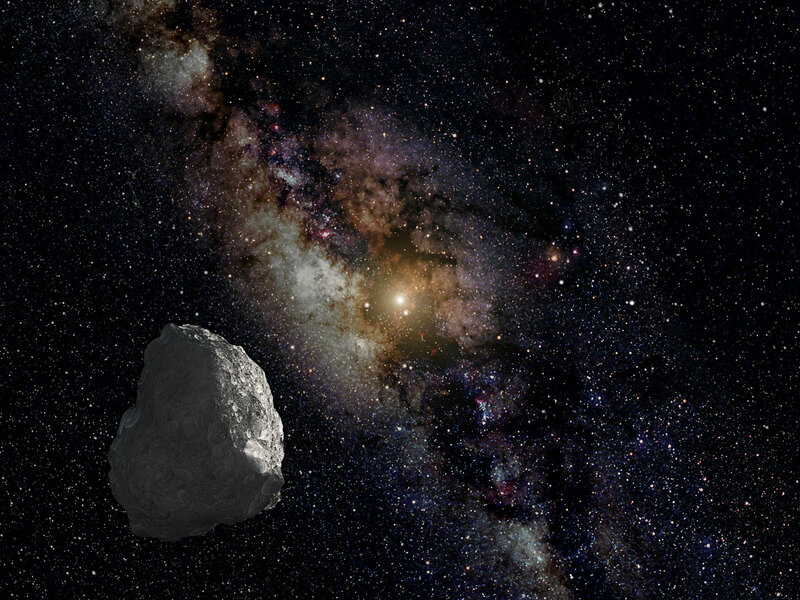 That’s a roo– tell us more about the Kuiper belt. Is that where Drac also comes from? KONSTANTIN BATYGIN: That’s exactly right. So the Kuiper belt is just a name given to this field of icy debris that all live beyond the orbit of Neptune. One of the more famous members of the Kuiper belt is Pluto. In fact, Pluto was the original Kuiper belt object. And what led to its demotion was the discovery of the remainder of these other objects. So in any case, the Kuiper belt you know typically has orbital periods of over hundreds of years– maybe 200, 300. And Niku falls exactly in that regime. Its orbital period is almost 200 years. So there’s nothing kind of out of the ordinary about it, except for its orbital plane. Its orbital plane is totally messed up. IRA FLATOW: That’s– and I know that you’re a Planet Nine aficionado, that strange who-knows-where-it-is planet out there. KONSTANTIN BATYGIN: Oh, I know where it is. IRA FLATOW: You do? Where is it? KONSTANTIN BATYGIN: [LAUGHS] No it’s– I mean I’m pointing to it right now. IRA FLATOW: [LAUGHS] I see that. But, yeah, but Drac and Niku are the same kind of planet. Does Planet Nine then inform you about where these– why these planets have such a weird orbit? KONSTANTIN BATYGIN: So interestingly, these guys are too close to Neptune to be affected by Planet Nine as their orbits are right now. Right now they live in the part of the solar system where Planet Nine’s influence cannot be seen. In fact, most of the known solar system is a region where Planet Nine’s gravitational influence cannot be felt. For example the earth’s orbit is not affected by it either. So these guys don’t necessarily tell us anything direct about Planet Nine. Could Planet Nine have played a role in their formation? Maybe. You know, I don’t want to sound like a broken record and sort of blame everything on Planet Nine, but it’s something that we could hypothesize. But the remarkable thing about Drac and Niku is that we really don’t understand where they came from. It’s a totally open question. We don’t have a mechanism to produce these types of orbits. IRA FLATOW: Wow. I’m Ira Flatow. This is Science Friday from PRI, Public Radio International. Talking with Konstantin Batygin about Planet Nine and these really weird couple of planets, Niku and Drac. Could it be– and I’m going to push you a little bit on this– could it be that Planet Nine, that strange planet, push these guys into that strange orbit, kicked them out somehow? KONSTANTIN BATYGIN: Yeah, I mean– I want to say, you know, I’m not saying it was Planet Nine. But between you and me, it was totally Planet Nine. KONSTANTIN BATYGIN: So it’s a great question. Is it a reasonable thing to speculate about? Absolutely. Planet Nine, we know that Planet Nine modifies the inclinations– the orbital planes– of objects that are further out, right about maybe a factor of five, or maybe seven further out than Niku and Drac. Could it be that the origin story for Niku and Drac that they used to be further out, plane got tilted, and then by getting scattered by Neptune its orbit sort of shrunk? Is that a reasonable story? I think it’s a perfectly reasonable story to investigate. I don’t have the calculations to support what I’m saying. So this is just– I’m just making this up as I go. IRA FLATOW: We got you. I do that a lot. We said the orbit was tilted 110 degrees. That means it’s gone past being normal, being perpendicular. KONSTANTIN BATYGIN: Mhm, that’s correct. IRA FLATOW: Is that even– is Drac doing the same thing? Do we know how? I’m trying to visualize that. KONSTANTIN BATYGIN: Yeah, so Drac is not quite as extreme. Drac’s inclination is 100 degrees, not 110. But it’s in the same exact ballpark, right? The orbits are tilted and they’re tilted by sort of a very similar angle, which is remarkable. So this is one of these things that pop up in the solar system every few years or so, where we think we have it figured out pretty well, and then a new object comes up and we recognize that there’s this whole population of objects that we didn’t understand. We don’t know the origin story for these things. And that typically leads to some added information and some added insight which informs the very formation of our own solar system in the first place. IRA FLATOW: So there should be more of these weird planets. KONSTANTIN BATYGIN: Absolutely. Absolutely, I think that we’re only seeing the tip of the iceberg here, right? Drac was the very first object discovered back in 2008. The fact that there are now two informs us of the fact that this is a real population. These are not two flukes that happen to have very similar orbital planes, this is a real population. And we need to figure out where it comes from. IRA FLATOW: I mistakenly called them planets. I’m just assuming they’re trans-Neptunian objects, right? KONSTANTIN BATYGIN: Yeah these are smallish asteroid-type bodies. IRA FLATOW: Well, we’re hoping that you find more, Konstantin, so you can come back and tell us more about these weird things. KONSTANTIN BATYGIN: Yeah, we’ll get to work. IRA FLATOW: And then I hope you’ll provide us the exact location of Planet Nine soon, I’m sure. KONSTANTIN BATYGIN: Yeah, you can bet on it. IRA FLATOW: Konstantin Batygin is assistant professor of planetary science at Caltech. Good luck in your quest. KONSTANTIN BATYGIN: Thank you very much. Astronomers say the Andromeda and Milky Way galaxies will collide in four billion years. Researchers calculate that there may be a large undiscovered ninth planet lurking in the distant reaches of our solar system.